Architecture exhibitions are famously difficult to curate. I remember Jacques Herzog saying he finds them usually boring. But then probably for someone like him there is not so much new ground or ideas to discover in an exhibition aimed at the general public. In any case it’s often hard to figure out the central curatorial idea – if there is one. Apart from just showing a certain architects archive and buildings, which in itself can of course be fascinating too. The Louis Kahn exhibition at the Design Museum in London is one of the main architecture events this year, along the seminal Sensing Spaces at the Royal Academy. As one of the most respected, and lesser known, figures in the world of architecture it is fantastic to have the opportunity to get to know his work better in this show. And the many models in particular do make you understand much better why Kahn is so important. You get a sense of his formal concepts being such an inspiration: those avant-garde forms from fifty years ago are now familiar elements of contemporary architecture. 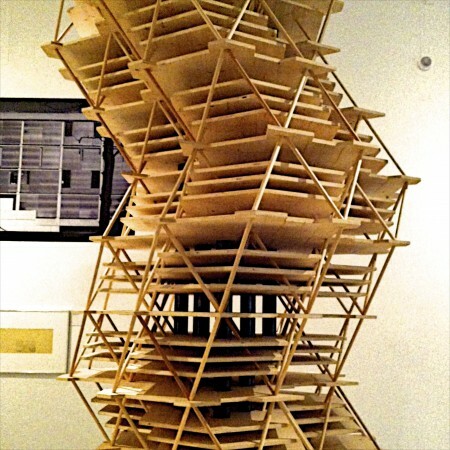 The structural models by leading architects for today’s skyscrapers and residential buildings, you can see them here. Kahn drew inspiration from patterns in nature, like Gaudi and Le Corbusier in their own ways did too. But you really get a sense of the scientific interests, combined to an individual aesthetic vision that forms Kahn’s legacy. As light was always such an important part of Kahn’s buildings, it is surprising that the models in the exhibition are not lit in a way that would explain that. Or not really lit in any specific way at all. The meaning of the forms could have been much emphasized by a lighting system that would have evoked a more realistic situation of the buildings, bringing them to life. And make us appreciate Corb’s idea of the play of architectural forms in light in relation to Kahn.